Mumbai’s celebrities came out in full force to celebrate the 25th anniversary of designer Vikram Phadnis in the Indian fashion industry. Veteran fashion designer, Vikram Phadnis recently celebrated the completion of 25 years in the industry with a big bash at JW Marriott Mumbai Sahar and a new collection named Adhvan. Popular for his modern take on fashion, Vikram Phadnis’ landmark collection featured urban influences and mostly neat and straight forward lines. A tribute to his journey so far, Adhvan literally translates as the road taken in Sanskrit. 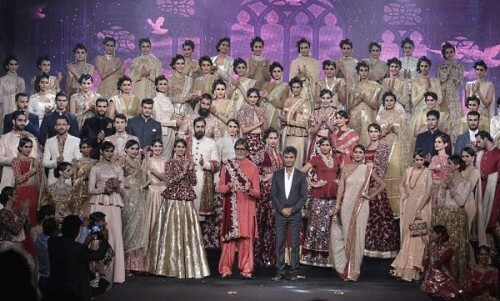 None other than Bollywood’s superstar Amitabh Bachchan walked the ramp for Vikram. 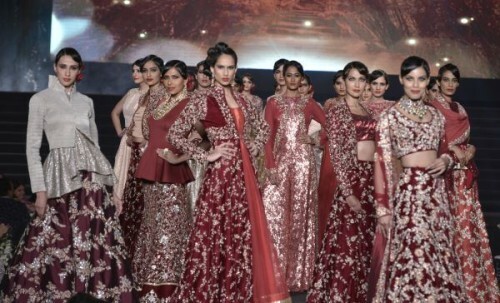 Wearing a maroon-coloured kurta and salwar, and a rich velvet stole with zardozi detailing, Amitabh received a standing ovation as he walked the ramp. ‘’I wish Vikram the very best on this special occasion. I met him long back during the shoot of the movie Aankhen and am pleased to be here on his big day. I like the colour in this kurta and enjoyed walking the ramp today amidst the cheer and goodwill he enjoys in the industry,’’ said Amitabh Bachchan at the event. The celebration was well attended by the city’s celebrities. The fashion show was followed by a formal dinner with champagne and many of his friends and well-wishers from the industry were in attendance. Several celebrities even wore creations by Vikram to the event, such as Kriti Sanon, Juhi Chawla, Ileana D’Cruz, Gauhar Khan, Shamita Shetty, Sooraj Pancholi, Athiya Shetty, Gauri Khan, Neelam Soni, Ayushmann Khurrana, Genelia D’Souza, Neha Dhupia and Esha Deol. Other famous people seen at the do were Jaya Bachchan, Shweta Bachchan, Aditya Thackeray, Ronit and Rohit Roy, Malaika Arora Khan, Zarina Wahab, Riteish Deshmukh, Vivek Oberoi, Naina Bachchan, Mehr Rampal, Boman Irani, Sushmita Sen, Rhea Pillai, Rahul Khanna, Neelam and Samir Soni, Yash & Avanti Birla, Sanjay Leela Bhansali, Kanika Kapoor, Mana and Sunil Shetty, Nitasha Nanda, Anu Malik, Shabana Azmi, Honey Singh, Neil Nitin Mukesh, Amrita Arora and Gauri Khan. To view photographs of these celebrities from the event, please click here. Tagged fashion, Indian designers, LifeSpice, Luxurious lifestyles, Sartorial Notes. Bookmark the permalink.